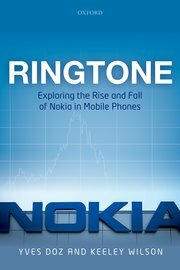 We are proud to announce that the winner of this year’s George R. Terry Book Award is Ringtone: Exploring the Rise and Fall of Nokia in Mobile Phones, by Yves Doz and Keeley Wilson. The George R. Terry Book Award is awarded to the book that has made the most outstanding contribution to the global advancement of management knowledge. The prize was presented at the Academy of Management’s annual conference, and we would like to take this opportunity to congratulate our authors on this prestigious achievement. To celebrate, we are taking a look back at previous Terry Award winners and finalists. In less than three decades, Nokia emerged from Finland to lead the mobile phone revolution. It grew to have one of the most recognizable and valuable brands in the world and then fell into decline, leading to the sale of its mobile phone business to Microsoft. This book explores and analyzes that journey and distils observations and learning points for anyone keen to understand what drove Nokia’s amazing success and sudden downfall. Provides a social constructivist and institutional explanation for expansion of organizations and an overview of main trends in organization theory. Much expansion is hard to justify in terms of technical production or political power, it lies in areas such as protecting the environment, promoting marginalized groups, or behaving with transparency. This book brings to life the reinsurance market through vivid real-life tales that draw from an ethnographic, “fly-on-the-wall” study of the global reinsurance industry over three annual cycles. This book takes readers into the desperate hours of pricing Japanese risks during March 2011, while the devastating aftermath of the Tohoku earthquake is unfolding. To show how the market works, the book offers authentic tales gathered from observations of reinsurers in Bermuda, Lloyd’s of London, Continental Europe and SE Asia as they evaluate, price and compete for different risks as part of their everyday practice. This book presents a novel and comprehensive process theory of organization applicable to ‘a world on the move’, where connectedness prevails over size, flow prevails over stability, and temporality prevails over spatiality. The framework developed in the book draws upon process thinking in a number of areas, including process philosophy, pragmatism, phenomenology, and science and technology studies. How do institutions influence and shape cognition and action in individuals and organizations, and how are they in turn shaped by them? This book analyzes seminal research, illustrating how and why influential works on institutional theory motivated a distinct new approach to scholarship on institutional logics. The book shows how the institutional logics perspective transforms institutional theory. It presents novel theory, further elaborates the institutional logics perspective, and forges new linkages to key literatures on practice, identity, and social and cognitive psychology. There is a moral to this book, a bit of Confucian wisdom often ignored in social network analysis: “Worry not that no one knows you, seek to be worth knowing.” This advice is contrary to the usual social network emphasis on securing relations with well-connected people. Neighbor Networks examines the cases of analysts, bankers, and managers, and finds that rewards, in fact, do go to people with well-connected colleagues. Look around your organization. The individuals doing well tend to be affiliated with well-connected colleagues. Managed by the Markets explains how finance replaced manufacturing at the center of the American economy, and how its influence has seeped into daily life. From corporations operated to create shareholder value, to banks that became portals to financial markets, to governments seeking to regulate or profit from footloose capital, to households with savings, pensions, and mortgages that rise and fall with the market, life in post-industrial America is tied to finance to an unprecedented degree. Managed by the Markets provides a guide to how we got here and unpacks the consequences of linking the well-being of society too closely to financial markets. Featured image credit: Books by Christopher. CC-BY-2.0 via Flickr. This post was written by the OUP Business marketing team.